This amusement park in Greece is divided into 2 sections: the Kidom for younger children and Allou!, with exciting rides for the older ones. There are rides to suit every age group and thrill threshold, from the serene and relaxing to the eye-poppingly scary. Allou! fun park is one of the biggest fun park in Athens that caters to people from all age groups. Enjoy many of its thrill rides and let the adrenaline flow. Some of the rides at Allou Fun park are 4G, 6G, Star Flyer, Shock Tower and horror train. Enjoy multi-dimensional rides like Saloon, Shooting Bar, Monkey Rugby and the Gold Digger. During winters, you can also enjoy ice activities like biggest ice skating rink of Greece and enjoy ice skating shows . Allou Fun Park is a complete family destination and also hosts occasional events during Christmas and Carnival. Grab a map from the information counter so that you can easily move around the park. Kindly read and follow all the park safety instructions. Fee parking space on weekend and holidays. Kidom family pass is only valid for Kidom. How popular is Allou Fun Park? People normally club together Daphni Monastery and Diamond Dolls while planning their visit to Allou Fun Park. Absolutely fantastic! 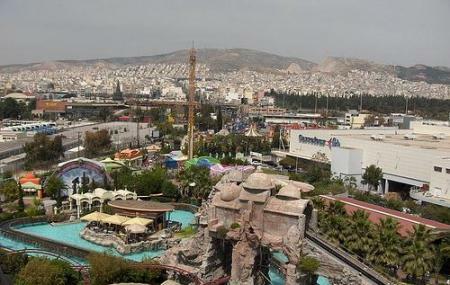 Definitely the best amusement park in Greece. Most Greeks know about it but if you're a foreigner visiting, you might want to enjoy a ride in Allou. (Even though, in my opinion, other amusement parks outside of Greece can't compare to it.) . Awesome place to bring my younger brothers.. they enjoy it a lot. But.. the transportation system is not so satisfactory. There should be a metro station nearby. After all, a child-friendly environment. And... For adults, it's much better. It's one of the most popular and amazing Luna Parks in Greece,and they are not wrong. The roller coasters are thrilling and fill you with excitement and adrenaline as a result to you wanting to go again and again. I have been there lots of times and every time I go there is an new ride waiting for me. Maybe the next time you are in Athens take a visit and see with your own eyes what I am talking about. Kids and I had a blast. Definitely visiting again. Loved the service, everyone there was very polite.